Soak Toor Dal for 1 hour, presser cook dal with 1 cup of water for 4 to 5 whistle. Let it cool down. Heat oil in kadai, add cumin seeds, hing, curry leaves, pepper, cloves, cardamom, tomatoes, garlic paste, ginger paste and saute till tomato become soft. Add salt, red chilly powder, turmeric powder, garam masala and mix well. Add boiled dal, and mix well. 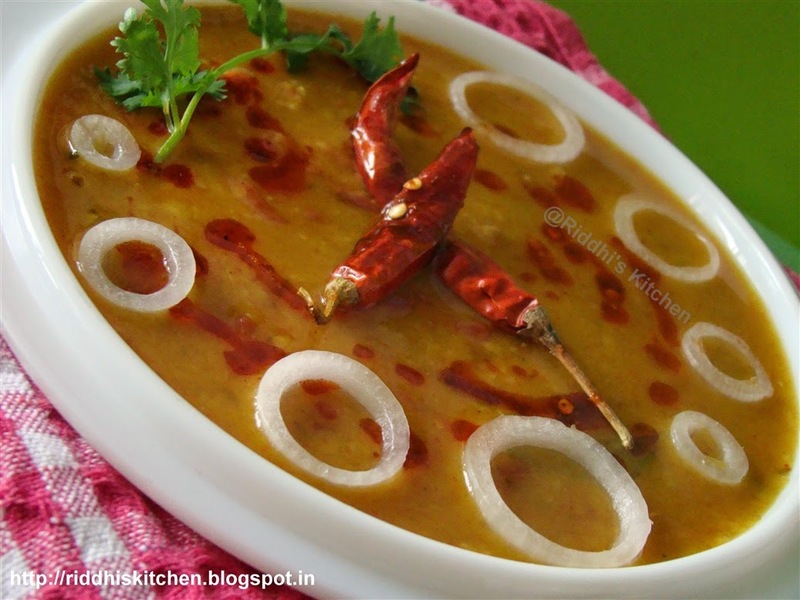 Add required water to adjust consistency of dal. Cook for 4 to 5 minutes. Switch off the flame. Add lemon juice and mix well. Heat oil in tadka pan. Switch off the flame. Add dry red chilly and red chilly powder, mix well. Take serving plate. Pour cooked dal. Pour tadka over dal. Garnish with dry red chilly, fresh coriander spring, onion rings.